Greater Anglia, Eversholt Rail and Wabtec Faiveley launched the refurbished Class 321 Renatus project at London Liverpool Street today (December 16). The four-car electric multiple unit (321304) is the second to be treated, and has been extensively refurbished. 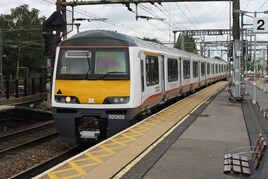 Eversholt Rail, which owns the EMUs, has committed to refurbishing 30 of the Greater Anglia trains. Work carried out by Wabtec Faiveley at Doncaster includes: total interior refurbishment including new seats, flooring and glazing; saloon air-conditioning with remote status monitoring; fitting fully compliant accessible and standard toilets with retention tanks; improved insulation and heating; fitting 240V power sockets for each row of seats; fitting WiFi and energy-efficient LED lighting; and fitting larger vestibule areas to improve passenger flows. The remaining 28 ‘321s’ will be treated over the next 18 months. The first production unit (321303) is currently with Vossloh Kiepe UK Ltd, having a new traction system fitted, and will return to passenger service early in next year. The new system improves journey times with better acceleration, and reduces operating costs through lower energy consumption and regenerative braking. For much more on this, read RAIL 817, published on January 4.